Parenting is not always smooth sailing. There are times when nothing you do seems to be going well. Your children don't listen to you, they answer back, they're uncooperative, they whine, they throw tantrums, they fight each other...on and on it goes. 1. Remind yourself that Allah does not give you what you cannot bear. Allah tests us in many ways and through many means. Children are one of them. When you feel yourself stretched beyond endurance, remind yourself that 'Allah does not burden a soul with more than it can bear.' 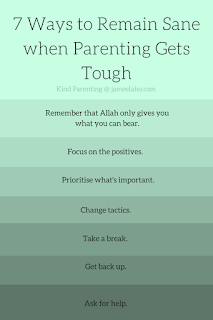 (Qur'an 2:286) So it may seem that your children are driving you beyond endurance but if you hold fast to patience each and every time, than you will pass this test in your life. 2. Remind yourself of the positives. Remember back to the times when your children are behaving in a positive way. Focus on this positive aspect of their character and behaviour. So that the next time they are behaving this way again, catch them at it and give positive feedback for it ("It makes me happy to see you put that away" or "I love it when you play nice together"). If you focus on the positive then it will encourage more positive behaviours but if you constantly focus on negative behaviours then it will bring about more of those behaviours. 3. Prioritise what is most important. What is most important to you concerning your children? Is it being respectful, responsible, cooperative, self-regulated or self controlled? Focus on changing or correcting one important behaviour first instead of everything at once. If you do everything at once it will be overwhelming for you and it will seem like you are criticising everything about them. So just pick one important thing and work on that first. If what you're doing is not working then try a different way of doing it. If nagging at your children isn't working then try "I messages" (I feel sad when you ignore what I say). If yelling doesn't get you heard then try talking quietly. Search for new ways of doing things. Take a break. Go into another room and sit down until you are calmed and rational again. Remember that Prophet Muhammad (s) advised us to keep silent if we become angry (Musnad Ahmad 1/329). If you give full vent to your anger then you will say things that you will later regret. So go for time out to think things through. 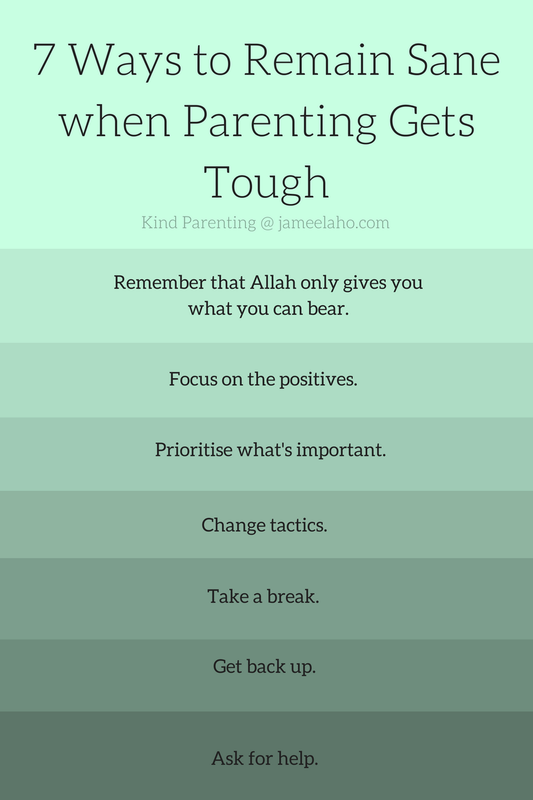 It may seem overwhelming and you're ready to give up on your parenting and your children but you need to get back up. Your children need you. If there is no one to guide them then they will either be much worse or lost. There is no shame in getting help. Sometimes it is good to have a second opinion from someone who will give us a fresh view of the situation and offer advice. This is not an extensive list. There are likely to be other things that you could do in this circumstance. What do you do that have helped you? Please leave a comment below.